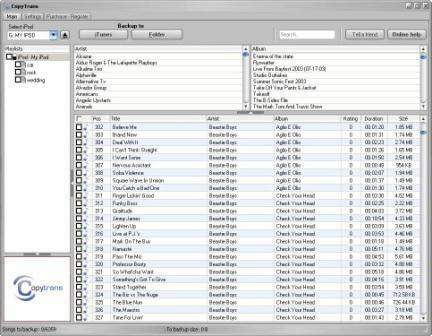 Nowadays, most of the songs, music tracks, audios, audiobooks, videos, movies, TV shows and other media files have been synced and transferred to iPod, iPod Touch, iPhone and iPhone 3G for on the move listening and viewing. You will think that medias on these Apple gadgets are the backup when you format or reinstall Windows, or when hard disk corrupted or crashed. Too bad, iTunes does not have function to sync these songs and videos back to computer, even though when it’s empty, and iPod is full of media. When you need to copy and transfer audio and video media back from iPod or iPhone to PC computer, CopyTrans can come to rescue, especially so if you don’t want to use the manual way to copy and transfer iPod and iPhone music and video to PC, as iTunes does not provide reverse-sync feature. 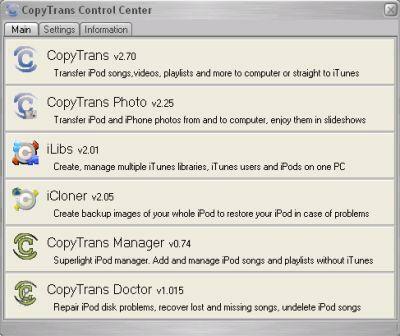 CopyTrans, which formerly known as CopyPod is a backup & recovery tool for songs and videos on iPod and iPhone. CopyTrans able to fully rebuild the iTunes library by retrieving, transferring and importing iPod music, videos, ratings, playlists, artworks, podcasts, play count and other metadata information from iPod, iPod Touch and iPhone to PC or iTunes. As an additional feature, CopyTrans also perform backup function to safeguard against accidental lost of both iPod and computer, by creating a backup of the content on iPod, iPod Touch or iPhone to external hard drive. Thanks to Geoffrey Duch from WindSolutions, My Digital Life gets a license to try out the CopyTrans. In fact, the trial version of CopyTrans is good enough, especially for users with small library, as 14-day trial version of CopyTrans is only limited to a maximum of 100 songs backup per session. Download the CopyTrans Suite Installer from copytrans.net, which also contains other software products from the developers, such as CopyTrans Photo, iLibs, iCloner, CopyTrans Doctor and CopyTrans Manager, which we will review in future, or you can download the standalone CopyTrans zip package, which does not require installation, and can be ran after unpacking to a folder. Using CopyTrans to recover the contents on iPod or iPhone to PC is indeed a very easy and simply task. Just connect the iPod or iPhone to PC, then run CopyTrans. CopyTrans will then scan through the portable media player to get a list of media files stored on the device. Then select which songs or movies that needs to be copied, transferred and restored (in CopyTrans term, it’s backup, probably to avoid lawsuit from Apple) to PC. Selection can be done one-by-one, or by playlist, artist or album. Of course, the important Select All check box is available too. 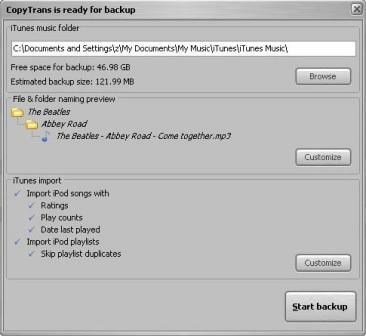 Then, users can decide whether to let CopyTrans copies all the songs or videos to a folder on PC, or restores the media to iTunes library library by clicking on “Backup to Folder” or “Backup to iTunes” button. Restoring to iTunes will present another dialog which allows user to select iTunes music folder, file and folder preview and customization, and what information to import into iTunes, such as ratings, play counts and date last played. Best thing is, when importing to iTunes, the order of the songs in playlists is preserved as on iPod. Once ready, click on “Start Backup” button, and all selected songs or other media will be transferred from iPod to local comptuer, and then been imported and populated nicely back into iTunes library (need to disconnect the iTunes half-way in the process though). If there is no iTunes installed (such is the case if you borrow iPod or iPhone from friend), just copy the music and movie tracks to a folder, which can be on a removable drive. Copytrans can create a XML file for iTunes import for later use. Other feature the MDL found useful is “incremental backup with fast duplicate checks” which suitable for user who may receive or download songs or music tracks directly via iPhone wireless connectivity, or regularly add songs to iPod from multiple sources. Incremental backup will download from iPod or iTunes to iTunes on local PC only the tracks that are missing from library. 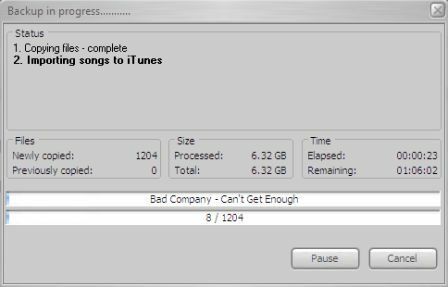 Once the iPod contents have been copied back to iTunes, the synchronization process now works as normally do, with songs will appear to be the same on local computer and iPod. In summary, CopyTrans provides a very easy way to copy back content on portable device to computer. It costs $19.99 to purchase the license to unlock the full version. The price is worthwhile to pay if you have bunch of music on iPod or iPhone that should be backed up or copied to PC, or else you will have to pay a bomb to get these songs again. Visit copytrans.net for more information on CopyTrans.